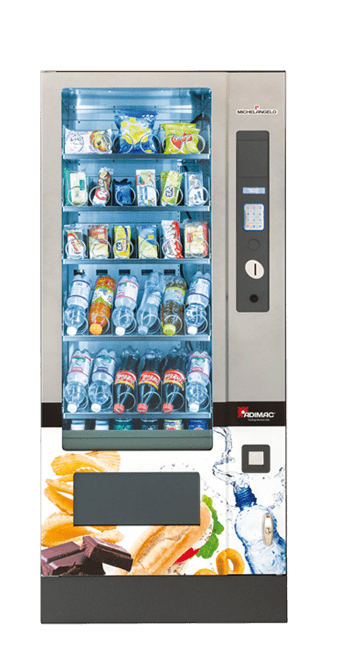 Automatic refrigerated food vending machine for snacks and soft drinks with excellent loading capacity. Thanks to thousand configurations Michelangelo is the most versatile solution of Adimac range. It is also available in Blindo version. It has the ideal size to be installed in positions of medium turnout. 6 trays holding up to 36 selections, it’s possible to add a seventh tray to increase the products variety on sale. Manufactured in metal to guarantee a great resistance and duration. It works with the standard protocols Executive and MDB, to have an absolute compatibility with any payment system. Equipped with a bi-zone refrigerating system allowing to keep a +3°C temperature in lower trays or +3°C temperature in the whole machine.